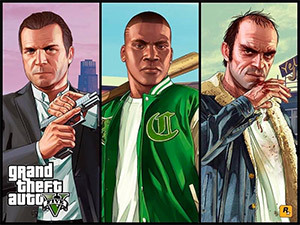 GTA V might be a dated game, especially when new AAA titles are released every year. Next iteration in the series, a remake, a new expansion set and so on and on. Only a few companies break out of this noise. Rockstar is one of them. That’s why GTA V is still a popular game many years after the initial release. Back when it was released, you couldn’t just play it on a PC. And when PC version arrived, only the very best gaming rigs could play it smoothly. Even now, this 5-year-old game remains a tough cookie if you want to play it on anything north of the lowest settings. And if you’re in search for the best laptop to play GTA 5, you’ll definitely need good pointers and some exemplary picks on what’s the best for playing Grand Theft Auto. Today, in this guide I’ll break down what is important for GTA and gaming in general, what are the exact components we should look for and what are the top picks for GTA in the second half of 2018. First off, let’s begin with the official PC requirements for GTA V.
These requirements are fine but they don’t clearly direct us if we’re searching for a laptop and not a desktop PC. That’s why I’ve derived equivalent to currently popular laptop component requirements for GTA V using their official requirements. I used the official requirements to match their recommended components to equivalent laptop parts. I used 3rd party benchmarks including 3DMark and PassMark tests. What is crucial for a GTA V laptop? As for every other game, processor and graphics card are the meat and potatoes when it comes to running any game without any lag and with a good framerate. A good processor is essential for GTA. Just as it was critical for GTA IV, it is just as important for the GTA V. Since Rockstar designed the game primarily for consoles, it is not very well optimized for PCs and therefore it is very taxing in the CPU department. For example, PC-optimized games like Far Cry 5 deliver much better graphics with a similar framerate on the highest settings. It doesn’t take much to get a high-end processor. In fact, laptop CPU performance tops out at ~$1,200 with i7-8750H and only at ~$2,600 we can see a faster processor – i7-8850H. And we would need an extra grand to see a real difference with i9-8950HK. The key is pairing CPU with the right GPU. If you can afford a laptop with GTX 1060, then I would go for 8750H or at least 7700HQ. But if you can only go up to GTX 1050 (including 1050 Ti), then 6700HQ and Ryzen 7 2700U are also OK. In a dire situation, you could still play GTA V with an integrated graphics module. You’d need to set graphics to the lowest preset and go down to 1366×768. Even 1600×900 is pushing it for an integrated graphics chip. With a minimal resolution you could reach 30-40 FPS which is playable if you’d listen to console players. You won’t have a good experience, but hey, I’ve endured through 15 FPS on Crysis 10 years ago and it wasn’t the end of the world. Why would you forgo a dedicated graphics card? Well, the most obvious reason – a very strict budget and somewhat different priorities than what I’d would expect from a gamer. If you want to play GTA V and no new releases and you’d rather save on money and battery life – you might as well go for an integrated graphics chip given you have a good processor. That’s a possibility but not one I’d recommend going for. Because of the listed limitations, in this guide I will only recommend laptops with dedicated graphics cards. This is where it’s at. Even if you’re on a limited budget, I recommend going for a discrete GPU. At ~$600 line you could get a decent laptop with a Nvidia MX150 chip which is miles ahead of anything you’d find integrated into the CPU. It can deliver ~50 FPS on medium/high settings mix and 1920×1080 but without any Anti-Aliasing. But that’s not much of a problem for laptops as they have a much better DPI than desktop monitors of the same resolution so sharp aliased pixel edges are not as apparent as they’d be if you’d be gaming on a 25″ monitor. And with just a couple extra hundred dollars we can go up to GTX 960M which is ~10 FPS better than MX150. But I would rather go for GTX 1050 which can be found just about at the same price of $800 – $1000 as 960M but it delivers ~10% better framerates. In this price range, we can find quite a few laptops with GTX 1050 Ti and 1060. Ideally, we’d want GTX 1060 which is a lot faster than 1050s. It can even play GTA V on highest possible settings and Anti-Aliasing on 1080p with an acceptable ~40 FPS when matched with a high-end CPU. That’s a steep jump in performance. The only problem might be balancing the GPU with other components as a mid-range laptop with GTX 1060 usually means that the manufacturer has made a lot of compromises in terms of battery life, display quality and possibly cooling which would defeat the whole purpose of getting a faster GPU! What’s the point of going for a faster graphics card if it will be bottlenecked by a thermally throttled overheating CPU. In many cases, I’ve had laptop’s performance falling off a cliff when it is cooled by a single fan. Then I would need to clean the filters & fans and if absolutely necessary – reapplying the thermal paste between the CPU and the cooling pipes. That is guaranteed to end any warranty you might still have. I will be cutting some corners in my recommendations to get the best possible performance for GTA V but there are a few corners that are particularly hard to cut. On one hand, I would recommend most people to get a laptop with an SSD. For most casual users, a decent Solid State Drive is more important than an extra bump in CPU or GPU benchmarks. But there are some exceptions. And gamers are one of them. For a gamer, there can be a lot of appeal of cutting out an SSD – then you’ll probably get a lot better CPU and GPU configuration than you would otherwise. But is it worth it? If you’re eventually going to upgrade your laptop with an SSD and you don’t mind the hassle of moving your files to a new drive then – YES. Also, if you’re on a very strict budget and you don’t really care about boot-up times, application startup and the fact that the PC will start to slow down and throw some bad sector errors – then yeah, sure, skip SSD. But if you want to have a setup that just works and will work for years to come and you’re OK with spending ~$250 extra for that – go for a laptop with an SSD. Also, go for at least 250 GB SSD, preferably 500 GB if you play more games than just GTA 5. There’s little to no reason to buy a laptop with a 4k or a 120Hz/144Hz display for GTA V but there are plenty of reasons to go for a display with an IPS panel. If a laptop has an IPS panel – it is almost always mentioned in laptop’s description. So if you can’t find “IPS” (not “IPS-like” or “IPS-type”) in laptop’s listing – it almost definitely has an inferior TN panel which comes with inadequate viewing angles, poor color contrast and (usually) a weak backlight. If you don’t particularly care about the display quality and you’re OK with a mediocre display – then nearly all modern laptops will suffice. In my personal opinion, I’d throw in an extra ~$100 for an IPS panel all other things being equal. Even a basic 8 GB machine can run GTA V without a problem but I’d recommend getting 16 GB as it will certainly speed up your laptop when multi-tasking, especially if you like to have 10s of open tabs in Chrome. Also, it’s a great way to future-proof your laptop. If you’re already stretched too thin – you can settle for an 8 GB model but even then I’d recommend checking if it can be upgraded. Ideally, it would have just a single memory slot used and one free. In that case, you’d be left with the potential of a dual channel memory in the future. That just means marginally better performance when both RAM sticks have the same configuration (frequency, capacity, storage and preferably voltage). When I started writing this guide, I did not anticipate finding a notebook around $700 that could play GTA on high settings without breaking a sweat. Oh boy was this a pleasant surprise! This Asus laptop covers every base and has some space left for future upgrades. It’s a great option for anyone on a very limited budget. RAM can be upgraded – this model comes with one slot installed with an 8GB DDR4 and has one slot open up to 16GB. Also, it has an empty NVME M.2 SSD slot which can be used to install a fast Solid State Drive without removing the 1 TB hard drive. It’s a true diamond in the rough for those that want the cheapest laptop for GTA V. It does not have a good battery life or a great display but it gets the job done. And in every other regard, it’s more than I could ask. Eluktronics is a little-known brand that has been delivering gems for gamers and performance enthusiasts. It seems they’re operating on the tiniest possible margin as they’re offering laptops that would usually cost $300-$500 more if they had Asus, HP or Lenovo logo. In the recent months, I’ve noticed a few small jumps in their prices as they’ve already collected a lot of good reviews from their customers. So in a matter of a year or two they might no longer be a “value” brand as they’re currently are. This particular laptop is better than the ASUS TUF in almost every single regard: faster processor, graphics, larger and better display, more memory and even a 512 GB SSD. That’s one solid set of specs for roughly $1k. Of course, it has a few limitations. The battery life is still quite poor and it weighs a hefty 6.8 pounds (3.1 kg). It’s best suited for those that want a laptop for replacing their desktop PC. If you’re a fan of first-person shooters, you’ll want to look at this Asus Strix model. It delivers even better performance than the previous laptops and it comes with a 120Hz display which can be appreciated by anyone who likes fast paced games. Sadly, it has no IPS panel which makes less appealing for casual gamers. An absolute beast of a laptop that does not scream out loud that it’s a gaming laptop. This upgraded HP Pavilion 15t seems as one of the best deals out there even considering its respectable price tag. Large SSD, high-refresh rate IPS display and 32GB of RAM? It surpasses all the requirements for GTA V and nearly every other game out there. Most certainly there’s nothing that offers as much as this custom HP Pavilion under $2k. If you want the ideal fusion of power and mobility – Gigabyte Aero 15X might be your best bet. It comes with the best performance out of every laptop here, best battery life and it’s the lightest of them all! It’s still not as light as a sleek ultrabook, but it’s as light as a top-shelf gaming laptop can get. There is a certain laptop which is essential for the user which will be going to get it from the suggestion and it will be decided to have it which will be going to make it workable for the user and it must be going to provide some best one.